Guide – LINE Puzzle de Inazuma Eleven (PuzzInazuma) « Too Many Penguins! 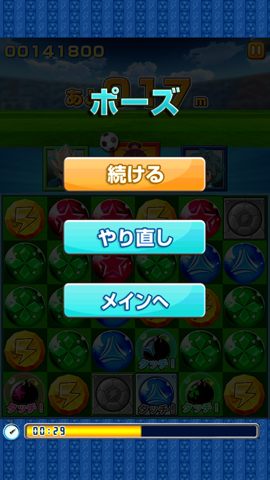 LEVEL-5 and LINE developed a free-to-play Inazuma Eleven app game, LINE Puzzle de Inazuma Eleven! 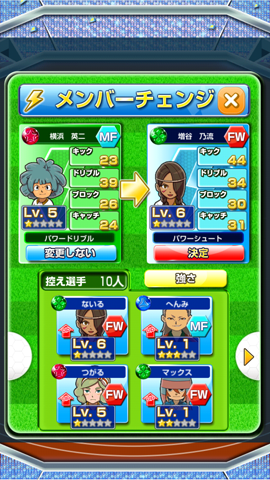 Battle your way up through various stages and build a dream team of your favorite Inazuma Eleven players! 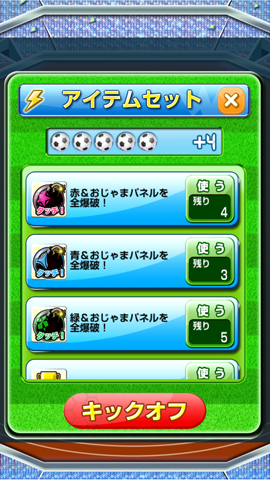 Everything is in Japanese but don’t let that intimidate you if you don’t know it; the gameplay is simple (especially if you’ve played other Inazuma games and/or know a bit about soccer), and you just need to remember a few buttons! When you first open this menu, you’ll be presented with your current team. Tap a player to change them. You can compare their stats before confirming (Red 決定 button). 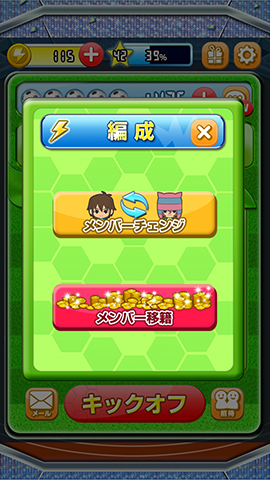 (Update March 27, 2014): You can now “sell” off your extra characters for coins! 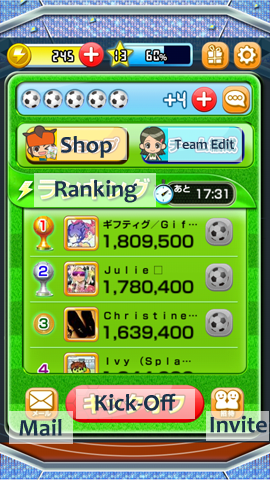 In the Team Edit menu, hit the bottom option with the gold coins showing. You can sell up to 10 characters at a time (no limit on selling otherwise). Just tap their image to select them and press OK when you’re ready. You can also sort browsing by レア度 (rarity) and ポジション (position). 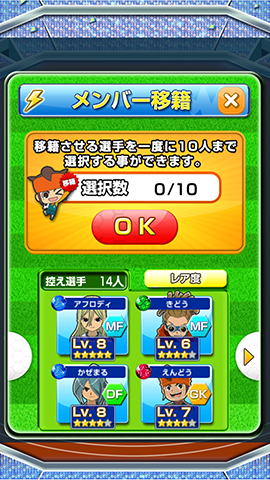 The characters currently on your team don’t show up on here, so don’t worry about them! 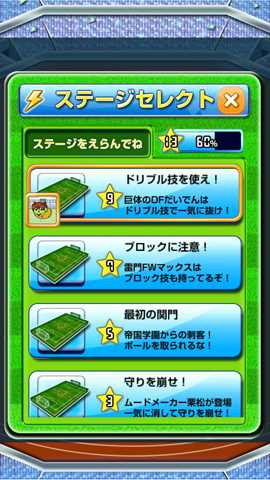 You can buy Level-Up boosts (green menu) and Scratch Cards (blue menu) with the in-game Gold currency (they’re pretty pricey if you don’t spend real Yen to get extra Gold, but you can save up or just win more battles for Scratch Card prizes). When you’re ready to start battling, hit the red Kick-Off button! You only start with the bottom stage at first, but as you level up, you unlock more stages you can challenge. Just tap to select! 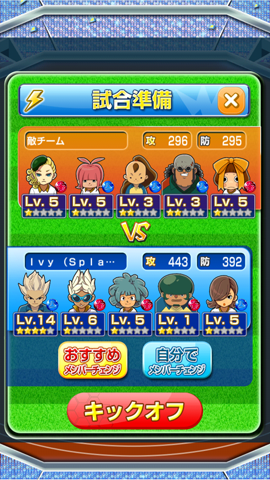 You’ll see the opponent’s team at top and yours below. You’ll also have the option to change your players to the recommended set (left yellow button) or change them yourself (right blue button), but if you’re all set, hit the red Kick-Off button. You can choose to use a special item boost or go without any. You’ll get bombs whether you use items or not, but the boosts increase their appearance frequency and let you clear out grey panels when you tap them too. 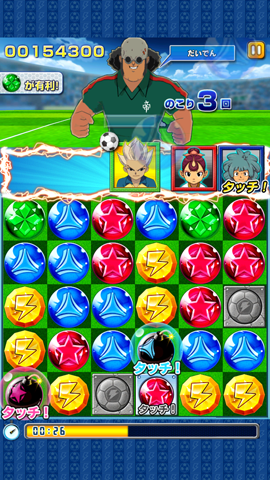 Trophies add to your final score (to get you better scratch card rewards), and yellow Inazuma symbol panels provide the largest score/damage boosts. Hit the red Kick-Off button and you’ll use a soccer ball to commence battle! The App provides an easy visual tutorial on the gameplay when you first play. 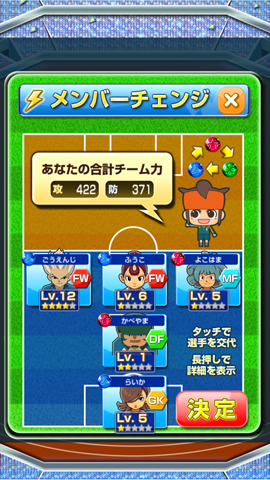 The symbol on the top left of the screenshot says that green panels are most effective for this player. Regardless of win, tie, or loss, you’ll receive experience at the end of each battle to help level you up. If you win, you’ll also receive a Scratch Card (higher score gets you better Scratch Cards). This is the Scratch Card, just select one of the soccer balls to scratch it off. 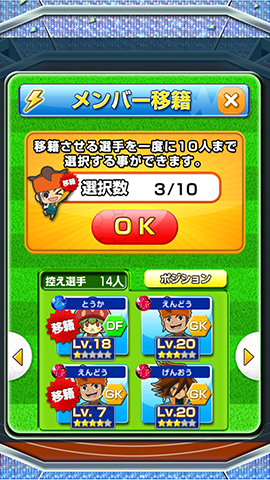 If you don’t get one of the players, you’ll get a boost, player level-up, or some Gold coins. You get presents after every time you level up, just hit the red “Take all” button at the bottom when you do so! Possible edits to come… questions etc welcome!! 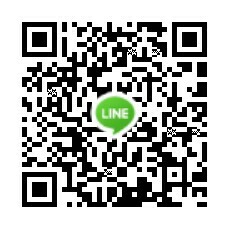 Let’s add each other, send each other soccer balls, and have fun!!! 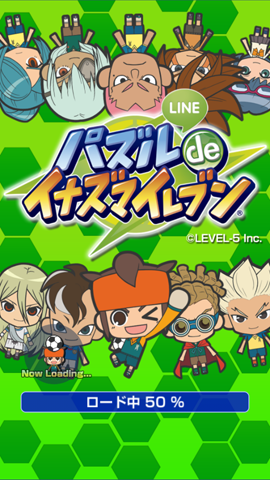 Sorry for double posting but here’s an alternative for downloading the game (which is a lot easier and faster) there’s this app called qoo (and after that some japanese symbols, just type in qoo in search and it’s the first one) and with that app you can download a couple of Japanese apps including Line puzzle de Inazuma Eleven. @SplashTOMATO Does the game have an exit button somewhere I’ve missed, or do you really have to force close the app? I’ve been force closing the app myself since I didn’t see an exit option either XD; If anyone knows otherwise…! I found this app a week ago and I really like it! Thank you for the guide! I added you! 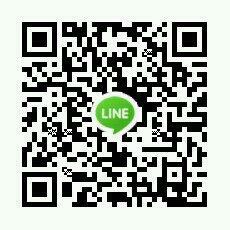 Here is my Line qr code. Can someone drop the .apk for it here? I’m one of those unfortunate souls with an unsupported android tablet, so an .apk for it would be most appreciated. Didn’t notice that link for the page with the .apk downloader. I blame having guests and being high on sugar. Now to see if my cheap’o tablet can run it. 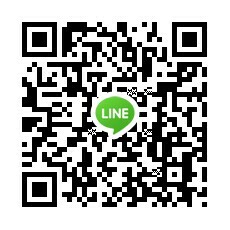 And it runs like a dream, so here’s my QR thingamajig. …I couldn’t figure out what HTML tag to use, so here’s the URL instead. 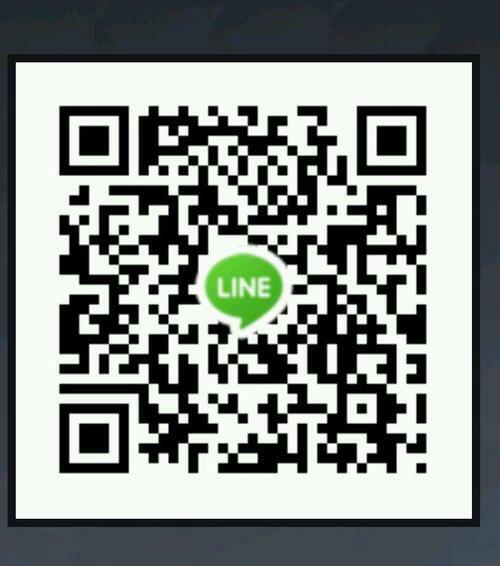 Jail Breaked device have been banned by Line. How sad. Are there anymore stages after level 39? 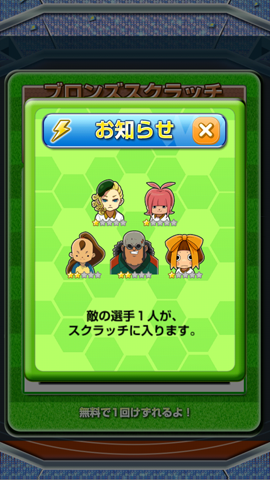 The one where the chara you have to scout is Hera I think from Zeus. Doesn’t seem to be any more stages after that ATM, but there are also periodic updates! Next update will probably be on the 10th after certain campaigns are over, so very soon! 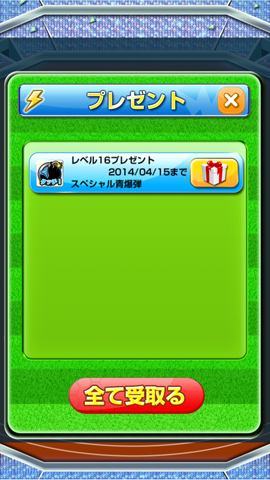 Are the scratch cards within a time limit, like a few months or so? 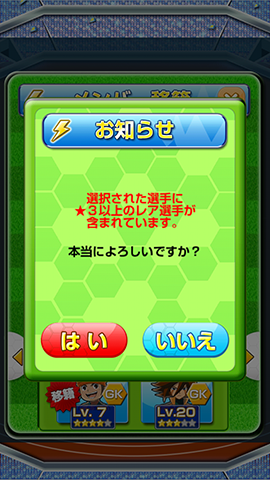 It seems like there is an update for the Inazuma Eleven Puzzle game but you can’t update it because of the japanese Play Store.. I tried already to uninstall the app, and install it again (with the AirDroid-way) but it still wants me to update it. I just want to know if there is another way to play the game again? Use the APK Downloader extension for Chrome instead of the website since the website takes time before it gets the latest updates! It requires a few more steps but gets you the latest straight from google play japan! 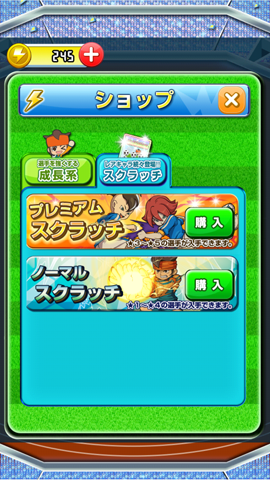 I updated my puzzinazuma app last night and had to log back in in order for it to work! 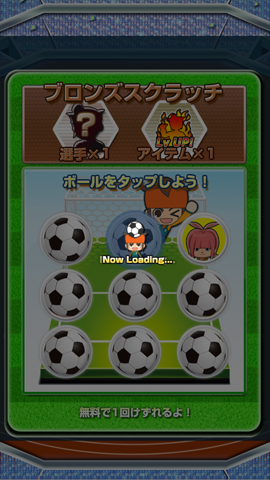 I’m trying to get Puzzle de Inazuma but it wont show up in the app store, and when using the link you provided, I’m redirected to a blank app store page. What should I do? I can’t seem to find the apk for the game in the apk downloader, or is it just me? 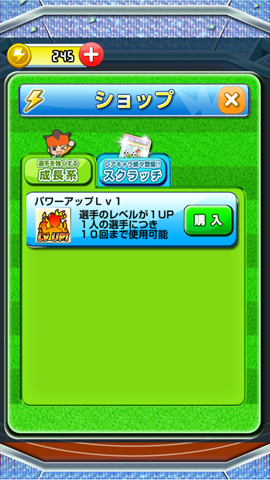 And when I tried using Qoo, it can’t find the game either. Can anyone help? Oh! The game was discontinued a long while back unfortunately, so it doesn’t work anymore anyway. I’ve updated the article accordingly.